This year the wineries and vineyards of the Yakima Valley are celebrating their 30th anniversary as an official American Viticultural Area. The AVA designation is granted by the Federal government, and this was one of the first anywhere in the country. A major feature story on the AVA and its sub-regions will be coming out in Wine Enthusiast magazine later this summer. But for those with a hankering to kick some dirt and see some of the grapes that made the valley famous, here’s a rare opportunity. Wine Yakima Valley is offering consumers insider access to some of the best grape growers in the state via a summer vineyard tour on July 27th. The tour showcases some of the valley’s oldest vineyards and most experienced grape growers. You will visit and learn from the owners of DuBrul Vineyard, Kestrel View Estates, and Kiona Vineyards. “A tour like this is generally offered to buyers and members of the media,” says Kerry Shiels of DuBrul Vineyard. “The education, wines, and opportunity to meet some of the state’s most highly regarded growers is rarely offered to the general public.” True story. The Kestrel View Estate Vineyard is home to some of the oldest Chardonnay, Merlot, Cabernet Sauvignon, Cabernet Franc, and Malbec vines in the state with plantings dating back to 1972. This tour will take you through the history of the vineyard and its significance to the Yakima Valley and Washington State grape growing. Guests will enjoy an intimate tour of this highly acclaimed vineyard and taste through some of Côte Bonneville's exclusive wines. Vineyard owners Hugh and Kathy Shiels have succeeded in producing grapes that express a distinctive terroir that has made DuBrul one of the most sought-after suppliers in the Northwest. See for yourself the unique combination that makes it so – the mineral deposits, the extensive irrigation system, and the steep rocky soils that are so important to growing exceptional grapes here. John Williams pioneered Red Mountain viticulture by planting Cabernet Sauvignon, Chardonnay and Riesling back in 1975. That original planting was followed by Merlot, Lemberger, and Chenin Blanc in 1976. This vineyard currently grows more than 20 varieties on approximately 250 acres. 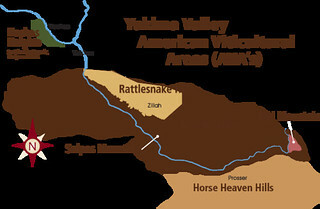 Red Mountain is now its own AVA, a sub-region of the broader Yakima Valley.